I am enjoying the cooler weather, especially being in the kitchen doing some long slow braised dishes like this pot roast beef stroganoff! In this dish the beef is slowly cooked until it’s so nice and tender that it literally melts in your mouth! In addition to making the beef meltingly delicious, this long cooking process also helps bring out a lot of amazing flavour! Speaking of flavour, the flavours of this dish are inspired by beef stroganoff, a dish consisting of beef, usually strips of steak cooked in a pan, along with a paprika, mushroom and sour cream sauce. This pot roast version starts out by browning some stewing beef (I like Ontario Corn Fed Beef), like chuck, brisket, etc., in a pan, making the sauce and then adding broth to simmer everything in. You can easily make this meal in one-pan and it’s great simmer on the stove top, in the oven or even in the slow cooker! 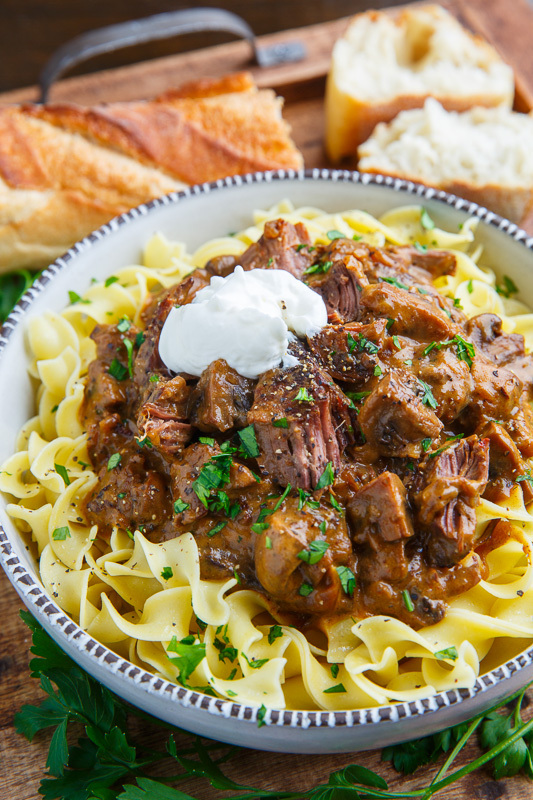 You can serve the pot roast beef stroganoff over egg noodles, rice or just eat a nice large bowl of it all by itself! 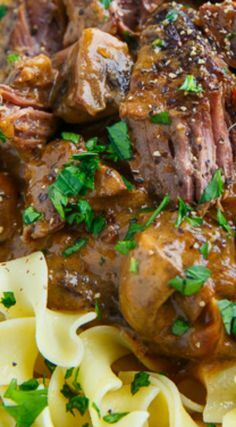 A homestyle comfort food pot roast take on beef stroganoff using slowly braised, fall apart tender, beef which is smothered in a super tasty, umami packed mushroom, onion, paprika and sour cream sauce! Heat the oil in a large pan over medium-high heat, add the beef (seasoned with salt, pepper and paprika) and cook until lightly browned, about 7-10 minutes per side, before setting aside. Add the onions and mushrooms and cook until the mushrooms have released their liquids, the liquids have cooked off and the mushroom start to caramelize and turn light golden brown, about 15-20 minutes. Add the garlic, thyme and paprika, sprinkle on the flour and cook until fragrant, about a minute. Add the broth and deglaze the pan by scraping up the brown bits from the bottom of the pan into the sauce with a wooden spoon. Add the beef, mustard, worcestershire sauce, fish sauce, and dill and either bring to a boil, reduce the heat and simmer, covered, until the beef is fall apart in your mouth tender, about 2-3 hours, OR transfer to a preheated 350F/180C oven and roast, covered, until the beef is tender, about 2-3 hours, OR transfer to a slow cooker and cook on low for 6-10 hours or on high for 3-5 hours. Remove from heat, mix in the sour cream and season with salt and pepper. 0 Response to "Pot Roast Beef Stroganoff"